John Mikita, is the owner of TransitGraphics and the Ozbus model range. He has been working in the transport industry for over 20 years. “My love for buses grew from a curiosity at a young age, reading timetables, looking at network maps was just something I did as a kid. This curiosity quickly grew out of control and I began working in the transportation industry as a planner. I then went on to start my own design agency specialising in the transport industry, from bus maps to infographics and everything in between. Now although this fulfilled my need to be involved with transportation industry I found that I still wanted to own these marvellous buses I had loved as a kid and see on our roads today. A bus doesn’t make for a good personal city car, it’s hard to park and keep maintained. I had to give up on my dream of owning one, until I realised there must be another way… create my own that I can have sitting on my desk and admire 24 hours a day”. 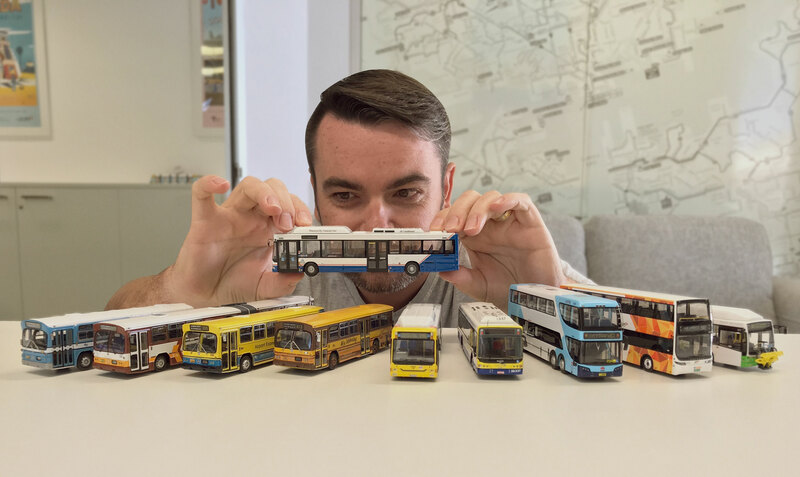 “Realising I could make model replicas of buses meant that I could own as many buses from all over the world as I wanted, that’s when my journey started. The first problem was how do I maintain the high-level of detail of a real bus into a 1:76 scale model. After thorough searching we found by utilising a handmade process combined with resin and metal etching we could create near perfect replicas. We get asked all the time why don’t we make the models in 1:87 scale to match model trains, but as much as I would love to do this, the scale makes it very hard to create every little detail as we have become known for in our models. Realising I could make model replicas of buses meant that I could own as many buses from all over the world as I wanted, that’s when I started to get really excited. Each model spends several months in development from perfecting the livery to test-prints using blue resin 3D printing, and continual revisions, until at last we can deliver a product which captures the true marvel of these buses”. Our aim now remains to continue developing new models of Australia’s most iconic buses for collectors, hobbyist and corporate customers.